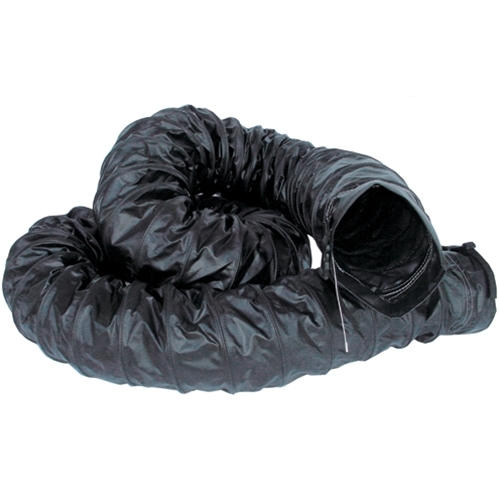 For a new set up or to replace old ducting from wear and tear over time, Air Systems International conductive, vinyl polyester ducting is available in a variety of sizes to meet your work site demands. Standard diameter is 8 inches featuring built in external wear strips. The inside wire hoop is reinforced with steel, with a 5 inch pitch. Attachment cuffs 6 inches in length are affixed to each end as well, with a diameter of 8 3/8 inches and also featuring adjustable belt straps on both ends of the ducting. With a max temperature rating of 180 degrees (F) the SVH-CND815 is a great solution when conductive ducting is required. Ducting designed to be conductive features grounding wires that are attached to each end of the wire helix. In addition to the standard 15 feet, Air Systems International also provides 6 foot and 25 foot options, as well as a host of custom transition pieces, accessories and connectors. Enlarge or reduce transition pieces easily and affordable with Air Systems at Intech Equipment and Supply. Air Systems International is well versed in breathing air systems and accessories, with almost 30 years experience in the industry. The 15 foot conductive ducting meets OSHA standards (1910.146) and Air Systems provides additional industry regulatory information as well as application details upon request. Browse the Intech Equipment and Supply online store for Air Systems International’s full equipment line up. Including solutions for air cylinder portability and storage, confined space ventilation, air compressors, portable lighting and much more. Experience and patents for multiple equipment lines provides great opportunity for custom ordering on top of an already vast selection of standard products. Order the equipment you need to match your applications and work sites today and into the future, put our relationships with the leaders in the industry to work for you! Our pros are available to help online, by phone and in person.